Since 1954, RefrigiWear has been a dedicated manufacturer of insulated outerwear and accessories for the industrial industry and general consumers alike. RefrigiWear’s products offer maximum warmth for extreme outdoor conditions and those in the offshore oil, gas and power businesses, where both the warmth and safety of its workers are vital. 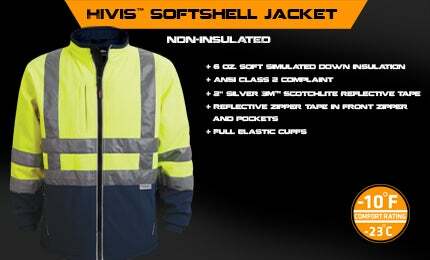 RefrigiWear’s products feature a variety of jacket / coat designs, as well as handwear, headwear and footwear. RefrigiWear knows the insulated industrial workwear industry and consistently sets out to produce exceptional insulated industrial workwear, accessories, and personal protective equipment for use in sub-zero temperatures, inclement weather and low-visibility environments. RefrigiWear is proud of the quality it offers to customers and its dedication to safety and protection. Along with the diverse coat styles and designs for both men and women, RefrigiWear clothing lines feature sweatshirts, vests, thermal shirts, its own Iron-Tuff -50 suit, coveralls, overalls, bibs, and more. The headwear line includes knit or fleece hats and caps, face masks, gaiters and balaclavas. There are more than 85 different handwear solutions in the RefrigiWear catalogue, including fully insulated gloves, glove liners, grip gloves, mitts, waterproof handwear, hi-vis gloves and more, including specialty items such as touchscreen gloves and stretch convertible mitts. RefrigiWear’s boots and footwear are also top-notch in construction and durability, warmth, strength and comfort are all considerations when producing all their footwear brands. Accessories and covers and bags round out RefrigiWear’s extensive and specialised range. For industries that require insulated protection in clothing and transport materials, RefrigiWear’s commitment to safety standards means its products are designed to protect workers on the job or the items they are transporting from the harshest of elements. This attention to safety is so important that RefrigiWear’s safety garments, footwear and WeatherGuard products are tested by outdoor experts to ensure they meet, and in most cases exceed, industry safety standards. Customer service is also of utmost importance at RefrigiWear, which means when the customer service team is contacted, customers will reach someone to have their needs addressed. This personal touch extends to the actual products, too, as RefrigiWear offers customisation of garments, hats and bags and will produce these quickly and cost-effectively. RefrigiWear is located in Dahlonega, Georgia, US where the majority of its products are quilted, cut and sewn. All the company’s products are US-made. RefrigiWear stands by its commitment to superior products, customer service, product knowledge, value, safety standards and care. At RefrigiWear, we pledge to commit the full resources of our company to completely satisfy the needs of our customers and employees.